30 Day Knitting Challenge Day 24: Have you ever made your own pattern or dyed your own yarn? How did it turn out? I have several patterns for sale on Ravelry and etsy, which all started with the Owl Honeycomb Blanket. That wasn’t actually my first pattern, just the first one I actually screwed up the courage to write, have tech edited, and published (I didn’t know about test knitters then). The rainbow sock yarn baby blanket (probably) was the first pattern … oh wait, no, no it wasn’t the first pattern I made up. I had a special button in my collection and made a felted belt specifically for it. I got the wool from the shepherd on ebay, which was special also – I love the greens in the yarn and it was one of my first all-wool yarns. The belt with the special button and special yarn -the special belt. Detail of the special button. Now, yarn dying – yes, I’ve done that too. 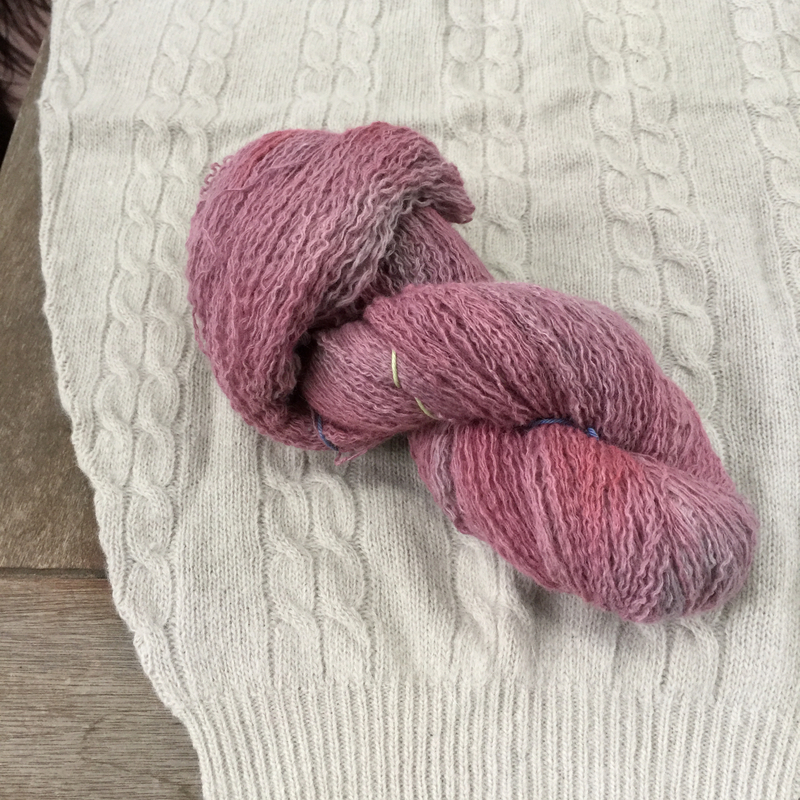 The very first time, I unraveled an angora-wool-nylon blend sweater and dyed it with KoolAid. Recycled sweater yarn dyed with KoolAid. The skein is sitting on the last remaining piece of the sweater, a sleeve. In the Spring of 2011 (2010?) I took a natural dye class with two friends at The Art League of Alexandria, which I really wish I lived closer to (I live over an hour away) so I could take advantage of their classes more. That class started me on an exploration of natural dying that I’ve only recently finally admitted has fallen by the wayside. If you’re curious, I documented most of it on flickr and on this blog, but here are all of my sample skeins, Lion Brand Fisherman’s wool in white mordanted with alum, copper, or iron and tossed into the dye pot with larger quantities of material. 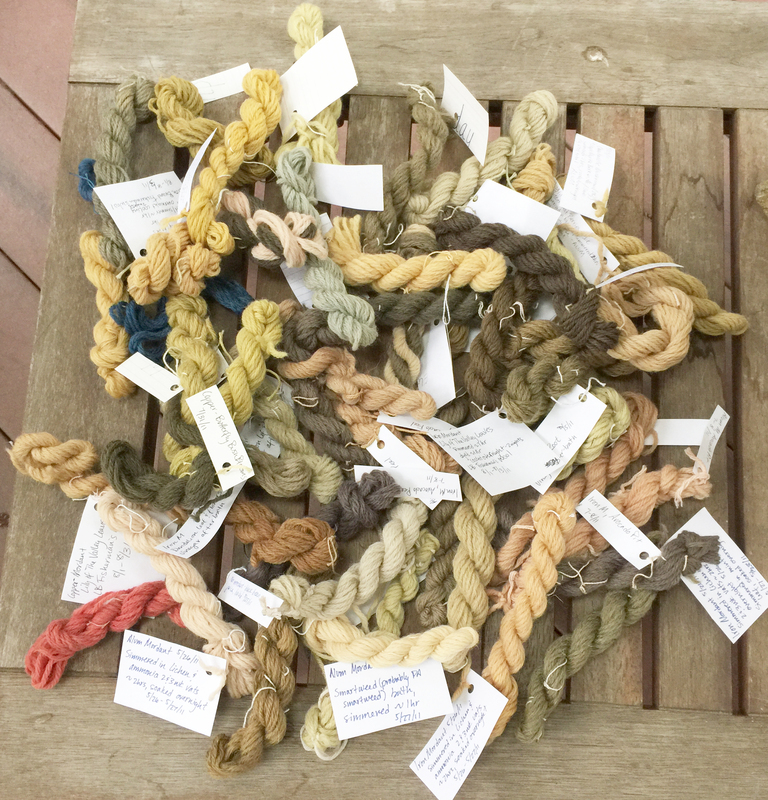 Natural dye sample skeins. Some of the natural dyes represented here: cochineal, indigo, walnut, osage orange, avocado skins & pits, dandelion, marigold petals, lichen, onion skins. Natural dyeing is a lot of work, so I also branched out to dye/over-dye with Jacquard Acid Dye, Rit, and most recently, Dylon (that Emergency Project). Dyeing is fun, even though when it’s a lot of work. It’s fun to see how the dyed yarn or fiber turns out. If it turns out badly, you can always overdye it with a darker color, keeping in mind that a pure black is very difficult to achieve; basically, you have infinite chances to dye something a color you like, it may just be darker than what you originally hoped for. I wish I had taken notes on my KoolAid dyeing, like which flavor I used and how much and what the dye method was – I only have the vaguest recollection of doing it. I have a friend who does chemical dyeing but mainly in her microwave, so her only dedicated equipment is a few plastic bottles to mix the dye in and some canning jars for microwaving. I picked up pots at a thrift store for natural & chemical dyeing, but did the Dylon and Rit dyeing in my washer. I hope to dye one day and thought I would start with Koolaid too 😀 Those are super cute patterns and I love your special button belt! Thanks, Paula! I should figure out where that special button belt is and start wearing it again! I’ve been gearing up to do some natural dyeing, so this post comes at just the right time for me. I’m looking forward to reading through your earlier posts about it. Im making a market Bag out of white craft Cotton and want to dye it after it’s finished what do you suggest for dye? Rit or Dylon, or probably anything from the big box craft stores (Michael’s, JoAnn, etc). Before you buy one, just read the packaging to see if it’s recommended for cotton and read the dye instructions to make sure you have everything you need & can follow them.